Have you forgotten all of your Sovietese? Can’t remember what ???? (????????? ???????????????? ????????? ????????? ?, Kazakh Socialist Soviet Republic), ??? (??? ????? ???????? ?, without the right to correspondence, part of a prison sentence that really meant execution), or ??? (????????-??????????????? ??????? ?, party-state control) stands for? Don’t fret dear post-Soviet citizen or bewildered non-Russian academic; a new book complied by Valery Mokiyenko and Tatyana Nikitina will save you. 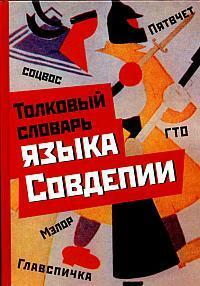 That book, reviewed in the Moscow Times, is The Dictionary of the Workers Paradise (???????? ??????? ????? ????????). A title, according to the review’s author, Michele A. Berdy, is an awkward translation. You see, ???????? is itself a term of the bygone Soviet past which was short for C???? ????????? or “council of worker, peasant and Red Army deputies”. With long titles like these you can see why they were shorted by smashing roots together or just making them into acronyms. I come across these all the time with my research on the Komsomol. Even the Komsomol itself is a creation such a chain of words. Kom-so-mol breaks down into “kom”, or communist (???????????????? ), “so”, or league (???? ), and “mol”, or “youth” (????????). The full name of the Komsomol is really the All-Union Leninist Communist Youth League (?????????? ????????? ???????????????? ???? ???????? ), or ???? ?, another horrendous name reduced to a simple five letter acronym. One of the longest of such acronyms is the name for the first Soviet secret police, the Cheka (??? ): The All-Russian Extraordinary Commission for the Struggle Against Counter-Revolution and Sabotage, or ????????????? ???????????? ???????? ?? ?????? ? ??????????????? ? ?????????. But are these really “anti-Sovietisms”? I am inclined to say no. Poking fun or ridiculing the state or the state’s culture hardly constitutes as anti-soviet. If anything, they are emblematic of the range of possibilities created by Soviet language that don’t undermine their hegemonic status, in fact, I would said reinforce it, but nonetheless creates a space for different articulations. A world like ??????? ?, while points to, and even mocks, the acute difference between a party member’s status and regular citizens, its articulation still reinforces that hierarchy. I doubt that Soviet citizens who spoke this word looked to rip the system any more than a Tsarist citizen with pornographic pictures depicting the Tsarina Alexandra with Rasputin, a post-Soviet citizen with a mocking picture of Putin, or for that matter, an American citizen who uses the word “Bushit” does. The book also contains what I think is one of the most fascinating aspects of Soviet language: the naming of children after revolutionaries, soviet holidays, industrial motifs, and even institutions. Berdy notes that names like “?????? (Lenin spelled backwards), ??? (Era) and ?????????? (Engelsina) for women and ???????? (Electron), ???? (Ural), ??????? (New World) and ???????? (Electric) for men” were fashionable after the revolution. My research attests to this. I found an article in a Komsomol newspaper from 1924 that suggested that Komsomol members name their children similar names. The reasoning was that since Christianity had saint names to commemorate and reinforce its ideology, communist ideology also needed “red names.” Some appropriately communist names were ????????? (October), ????????? (Star), ??? (Communist Youth International), ??? (International Youth Day), ????? (Change), and ????? (Study). At any rate, Dictionary of the Worker’s Paradise sounds not only like a valuable resource for people like me, but a reference to the awkward, and even wacky, side of Soviet everyday life.